The full English name of this family could be: Whipbirds, Wedgebills and Jewel-Babblers (Dickinson 2003). It is a small family of secretive, mostly forest-dwelling birds of Australasia. Traditionally, these were included with logrunners and quail-thrushes in the family Orthonychidae. Then Sibley & Ahlquist (1990) split out the logrunners as a family [see Orthonychidae page]. But the quail-thrushes of Australia still remained with these other species, and for a while they were known as the Cinclosomatidae (Sibley & Ahlquist 1990, Sibley & Monroe 1990). Recent DNA analysis, however, also splits out the quail-thrushes as a distinct family (Dickinson 2003, Barker et al. 2004; see Cinclosomatidae page). So with the quail-thrushes taking the family name with them, a new name was needed again. Initially, the oldest name (and thus the priority) belonged to Rail-Babbler Eupetes macrocerus; the family was briefly named the Eupetidae. But the rail-babbler proved so distinctive that it deserved family status on its own (Dickinson 2003, Jønsson et al. 2007; see Eupetidae page). The rail-babbler's closest relatives proved to be the rockjumpers of Africa [Jønsson et al. 2007]. So the rail-babbler became the Eupetidae, leaving the Whipbirds, Wedgebills and Jewel-Babblers as the Psophodidae. Confused? Welcome to the wide, new, wonderful world of biochemical taxonomy! Seeing any of the whipbirds, wedgebills, and jewel-babblers can be a challenge to the observer. The whipbirds of Australia have loud distinctive vocalizations that announce their presence in the understory. That of the male Eastern Whipbird ends with a note like the crack of a whip, to which the female immediately answers 'chew-chew' (Morcombe 2000). Seeing one is another matter. I remember hearing them all the time around Cassowary House in northeast Queensland but seeing them only with difficulty. I have no photos myself of this family, so I asked my friend Murray Lord to see if any of his Aussie friends had photos. He tried but didn't come up with anything so finally he took things into his own hands, trundled his new camera down to the back of his Sydney 'garden,' and photographed an Eastern Whipbird himself (left or above). It turns out to be a great shot of this jay-sized bird (© Murray Lord). 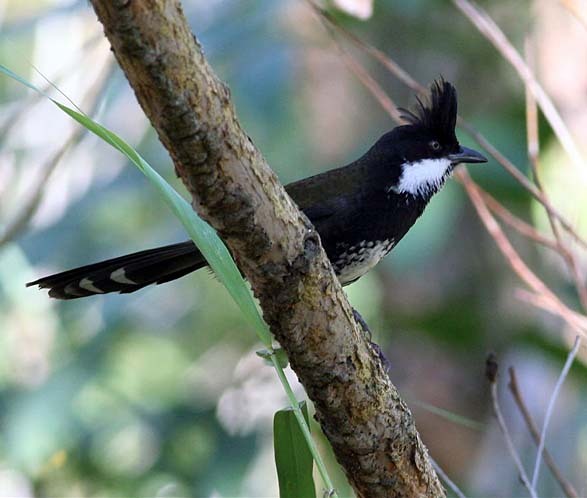 Dickinson (2003) lists two additional species of whipbird in Australia — Western Psophodes nigrogularis and Mallee P. leucogaster (this latter taxon is a relatively new split) — and another from west-central New Guinea, Papuan Whipbird Androphobus viridis. These have distinctive voices but not the 'whip-crack' note. Then there are the two wedgebills of the mulga zones of the Australian interior. Each is named for a characteristic vocalization: the Chiming Wedgebill (right) is shown here in a fine photo by Hans & Judy Beste. It, like all the wedgebills and whipbirds, has a little crest. 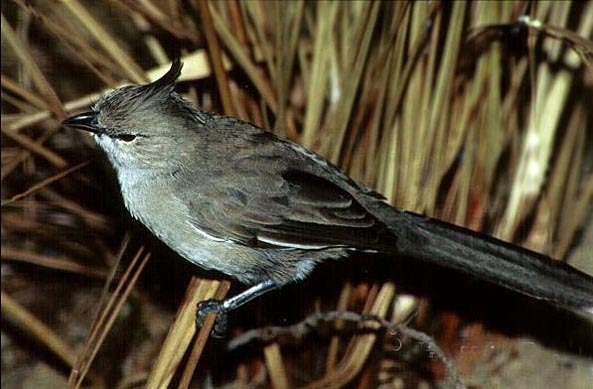 The final wedgebill is the Chirruping P. cristatus. The three species of jewel-babblers Ptilorrhoa replace each other elevationally in the rain-forests of New Guinea. Each is a spectacular combination of dark blue, white, or chestnut. These fabulous birds hunt singly or in pairs on the forest floor, communicating through penetrating whistles. To date I have seen two species, and each encounter was a memorable experience. The Chestnut-backed Jewel-Babbler Ptilorrhoa castanonotus was seen in 1983 inside the rain forest at Varirata NP, and another was seen in forest at Baiyer River sanctuary. This is a mid-elevation species; I have yet to see the lowland Blue Jewel-Babbler P. caerulescens. The Spotted Jewel-Babbler P. leucosticta was high in the Arfak Mountains of Irian Jaya (as it was then called) in 1994. I was able to spend a morning alone with Seth, our local guide. With just the two of us we could move slowly and comparatively noiselessly on the trail. Seth's great eye-sight spotted this snazzy bird as it walked on the humid forest floor above Mokwam (4500'). This group of birds is not that well studied, and much remains to be learned. As we see from the opening paragraph, even their taxonomy remains uncertain. One new paper suggests they may be most closely related to sittellas (Cracraft et al. 2004). But whatever their taxonomy, these are really cool forest-dwelling species (or other interesting habitats like mallee and mulga). Each one is worth searching out for its own distinctive value. Viva le experience! Photos: Murray Lord photographed the Eastern Whipbird Psophodes olivaceus on his property in Sydney, New South Wales, Australia, on 10 Apr 2005. Hans & July Beste photographed the Chiming Wedgebill in Australia (details not provided). Photo © 2005 Murray Lord (top) and © 2005 Hans & Judy Beste (bottom) and used with permission; all rights reserved. There is no "family book" covering the Psophodidae, although outstanding photographs and information about Australian and New Guinea species are found in Frith (1979) and Coates (1990), respectively. The latter has some particularly stunning photos of jewel-babblers. More details of the Australia species at Morcombe (2000) and Simpson & Day (1996), and of the New Guinea species in Beehler et al. (1986).